【24s Fast Heating】Our handheld garment steamer quickly heats up the water in 24 seconds and when it is heard like boiling water you can use it. At that moment, the steam firing power is high because the amount of steam is excellent and stable for fast ironing. For those who have little time and want no wrinkles, it is a great selection. 【Anti-Drip System & Great Capacity】The vaporizer incorporated in the system to detect water leaks and avoid the danger of being burned by boiling water. Also, you don't need to add water frequently for its 320ml large water capacity. It's automatically shutdown for safety when it gets too hot or has a low water level. 【180°Rotatable Portable for Travel】Famirosa clothes steamer is practical and portable enough which doesn't need an ironing board. The exclusive design of the body and 180-degree rotation of the head are not only easy to hold in one hand but also light and its compact size can be considered to carry in your suitcase. It is ideal for travel, business trip or any hurry timing. 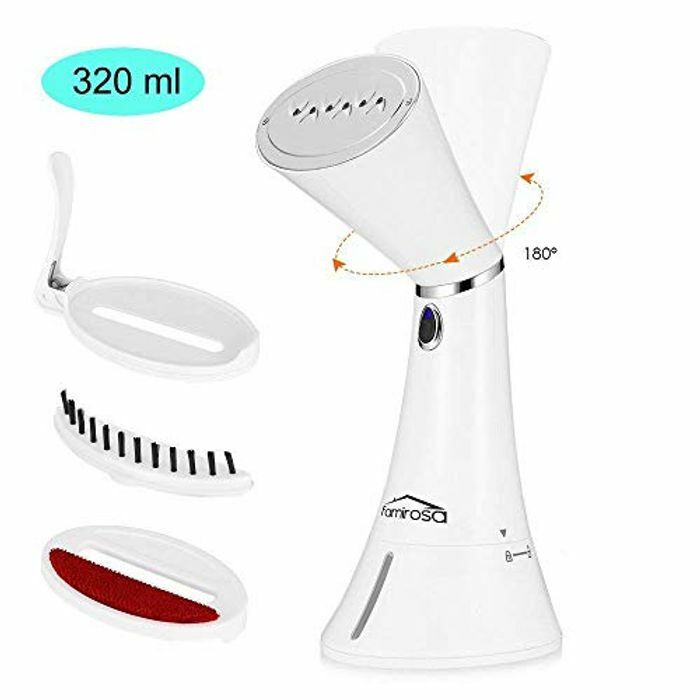 【Suitable for Various Types of Fabrics】The portable steamer comes with three different accessories which makes the steamer adapt better to any surfaces or fabrics. It's suitable for nylon, silk, linen, cotton (almost all types of fabrics) and also has other uses such as ironing sofas, curtains and so on. It will eliminate wrinkles and odors from clothes. 【Note】This product is NOT suitable for plat or inverted steaming; please move the steam jet just up and down to facilitate wrinkle removing. This looks quite good. Thank you very much for sharing.